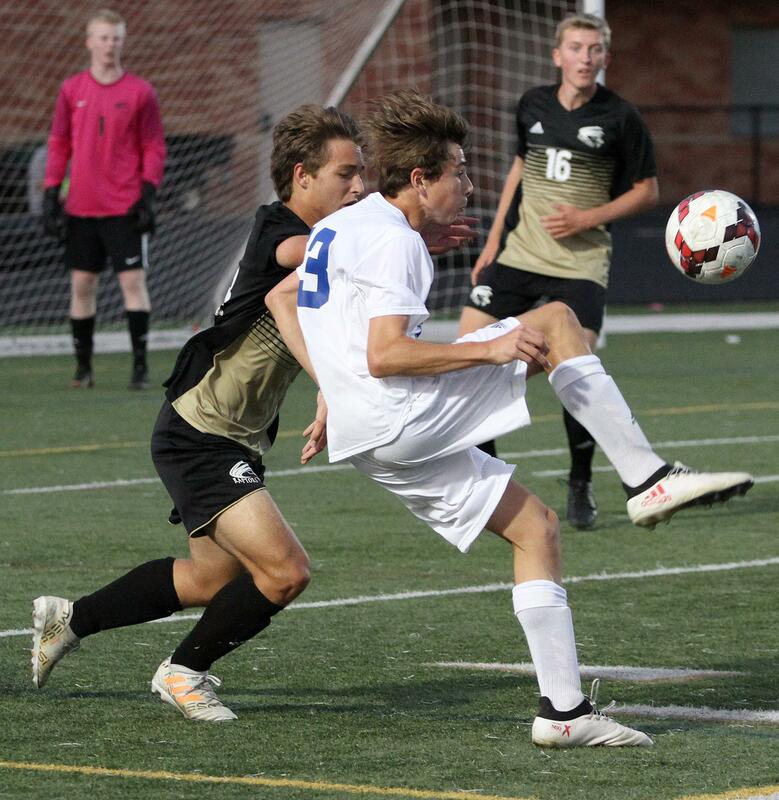 Chris Duliere’s goal on a corner kick gave the Raptors the victory. Early in the second half of Tuesday’s match between Woodbury and East Ridge, a hockey-like scrum broke out in front of the Royals’ net. All that could be seen was a crowd of players from both sides. Then, suddenly, the ball rolled slowly into the back of the net. The Raptor crowd and players celebrated, but it wasn’t clear who scored the goal. That didn’t matter, however. What mattered was East Ridge had gone ahead 1-0. Both sides of the crosstown rivalry admitted how much of a battle it is each time the teams meet. That was evident when the Raptors had to scratch and claw their way to a 2-1 win on home turf. Prior to the chaotic opening goal, the rivals played to a scoreless draw in the first half. This was all according to plan for East Ridge, ranked No. 7 in the Class 2A coaches’ poll. The wind had been howling to the open end of the Raptors’ stadium. Since they were attacking into the wind in the first half, East Ridge chose to play conservatively. With the wind at their backs, the Raptors (4-0-2) scored in the 52nd minute, when the scrum broke out. 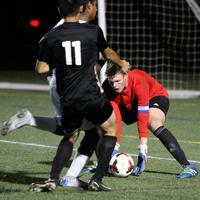 The key to the play came when the Woodbury goalkeeper fell down, which left the net open. Woodbury (1-2-2) couldn’t capitalize on the wind advantage in the first half but came out much more aggressive in the second half. The Royals evened the game 1-1 as sophomore attacker Devin Padelford hit the right side of the net, sneaking his shot past East Ridge goalie Nick Wagner. As the minutes ticked down in the second half, a draw seemed likely but then the action picked up. The Royals had a long offensive possession that led to a shot going off the post. Shortly after that, East Ridge got a corner kick. The kick went directly to junior defender Chris Duliere, who headed it in all in one motion to give East Ridge a 2-1 lead. The Raptors had failed to convert on prior corner kicks. But that one turned out exactly how East Ridge wanted it to. The win was revenge of sorts for the Raptors. Their last loss was in last year’s Class 2A, Section 4 playoffs, when they fell to Woodbury 1-0. In the spring, East Ridge graduated all-state midfielder Grant Tostenrud and attacker Nate Casas. With that frontline talent departed, Bidwell and the Raptors knew this season would be about the entire group, which showed Tuesday night. 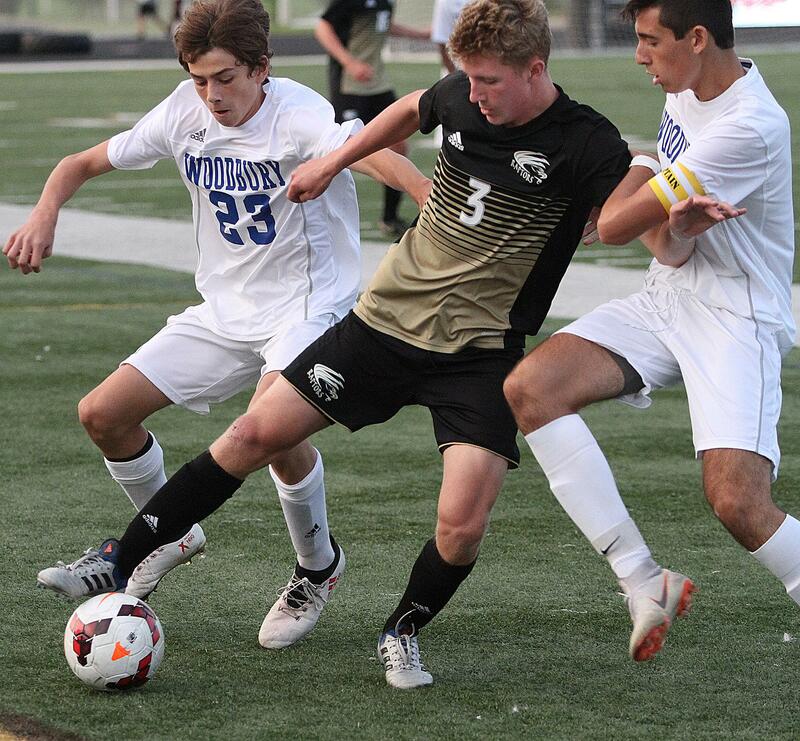 With the score tied 1-1 late in the second half of Tuesday’s game between East Ridge and Woodbury, Raptors junior defender Chris Duliere headed in a corner kick to give East Ridge a 2-1 home victory over its Suburban East Conference and crosstown rival. The Raptors and Royals played a quiet first half, combining for six shots on net in the opening 40 minutes. The Raptors, ranked No. 7 in the Class 2A coaches’ poll, broke the deadlock in the 52nd minute when junior midfield Cullen Featherstone rolled one in while in the midst of a crowd of players from both teams. 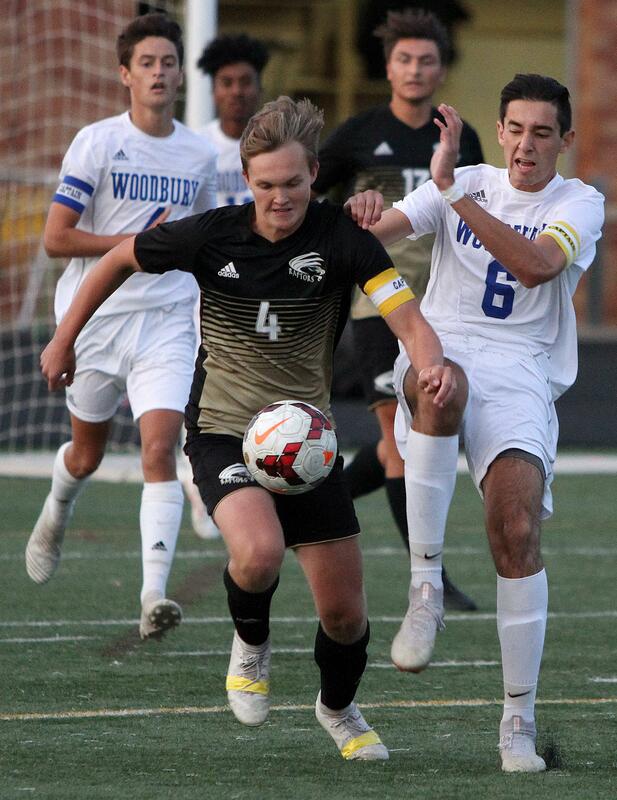 Woodbury (1-2-2) responded in the 61st minute as sophomore attacker Devin Padelford kicked one in past Raptor sophomore goalkeeper Nick Wagner to tie the game at 1. Wagner came up big for East Ridge (4-0-2) in the second half, stopping five shots to help hold off a furious Woodbury rally in the final minutes to finish with seven saves. Royals senior goalie Scott Sampson also dazzled with 10 saves in the match.